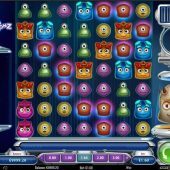 Reactoonz slot is another Play'n Go edition in their cascade grid format, to accompany old classics like Gemix and newer ones such as Cloud Quest, Viking Runecraft and Moon Princess. It appears the large wins those games can award will be scarce here, and the mood is set in display mode by a cartoon character snoring loudly, something which I found it difficult not to emulate after 10 minutes or so. The theme is typical Swedish juvenile symbols, in this case one-eyed and two-eyed 'aliens' and inane robotic noises and sound effects compound the initial dismay at the appearance of the game. So ignoring the silly aesthetic side of things, how will our bankroll react to Reactoonz? All the two-eyed symbols - pink 1x/750x, green 0.8x/300x, yellow 0.6x/150x and blue 0.5x/75x. No card values, but we get 4 lower-value one-eyed icons - purple or orange 0.15x/10x, green or yellow 0.1x/3x. One random symbol is highlighted every play and if it created a win will leave leave 2 Wild symbols behind on the grid after the pay is logged. Any winning shape will also leave a 2x2 block itself on the grid with a 2x multiplier on it (called a Giantoonz) to increase the chance of a repeat win as only one further symbol of the same type needs to touch it on the next cascade for another win. Wilds can appear left behind as described just now or you may randomly see the three-eyed thing on the right of the grid go into 'Instability Mode' and throw 4 to 8 onto the grid after any non-winning play. You can't get 'natural' Wilds in the game. Implosion - transforms 3 to 6 random symbols into Wilds and destroys their surrounding symbols. Incision - puts a Wild in centre position of the grid and then an 'X' corner-to-corner becomes a random similar icon. Demolition - destroys all one-eyed icons in view. Alteration - picks a random one-eyed symbol and transforms all other one-eyed symbols into the same. You will see these 4 features on a meter on the top right of the screen and any you've accumulated will trigger in turn when your cascade ends in a non-winning combination. This should mean your cascade continues and if it does and reaches the 5th. bar then you get the top Gargantoon Bonus. This will drop a giant 3x3 Wild onto the grid randomly and award the pays. After this, it breaks up into two 2x2 Wilds which are added thus guaranteeing another win. The final part of this sequence then occurs, and now your two 2x2 Wilds become 9 individual Wilds randomly placed on the grid. This is where you are most likely to see the Reactoonz slot's largest pays which you need blocks of 15+ icons to get!